The swelling Setikharey stream yesterday threatened 16 households of lower Pelrithang in Gelegphu. Eight households were affected and their belongings were evacuated to safer ground yesterday. After battling for half day with the help of Army, Police personal and DeSuup using heavy machinery, volunteers managed to divert the swollen river to its normal course. However, due to continuous heavy shower, the swollen monsoon stream started making its way to same village located just above the Gelegphu-Zhemgang highway at early hours today. The rescue teams evacuated three houses and two shops today. 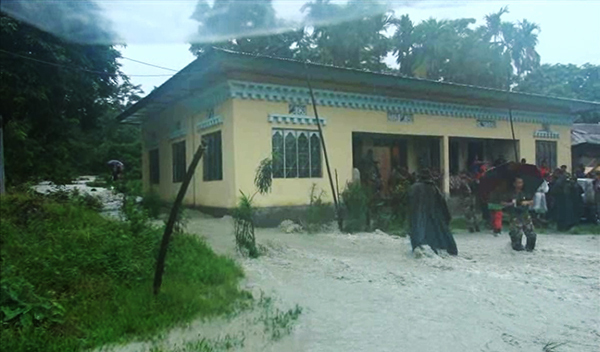 The swollen Setikharey stream affected a total of five households and two shops above Gelegphu-Zhemgang highway. The rain stopped around 10 am in the morning and the Mao river subsided. Gelegphu Thromde officials, Police personal, forest and Scout students are carrying out restoration works of Gelegphu Thromde Water treatment plant at Mao river. Gelegphu Thrompon said if the weather conditions improve, they hope to restore water treatment plant within two to three days. Today, they are looking to supply water from old existing tank, which is under repair.